Hi everyone. I had a question regarding the members of the real organization. Are they (marluxia, larxene, etc) the recreated somebodies (braig, lauriam, elrena, isa), of themselves from the past? I feel like they have to be their somebodies, but it's implied they're nobodies. How would this work, being they all died as nobodies in the past? It was implied they gave up their humanity to become nobodies again. Hence the fading when Sora defeated them. Being a nobody meant they were emptier making them better vessels for Xehanort. Yeah I was confused by that too. At some point they do mention that some of the characters traveled through time as hearts and had vessels waiting for them so they could exist in the present. But then Sora sais you're gonna be whole again to one of them after being defeated, I can't recall who. 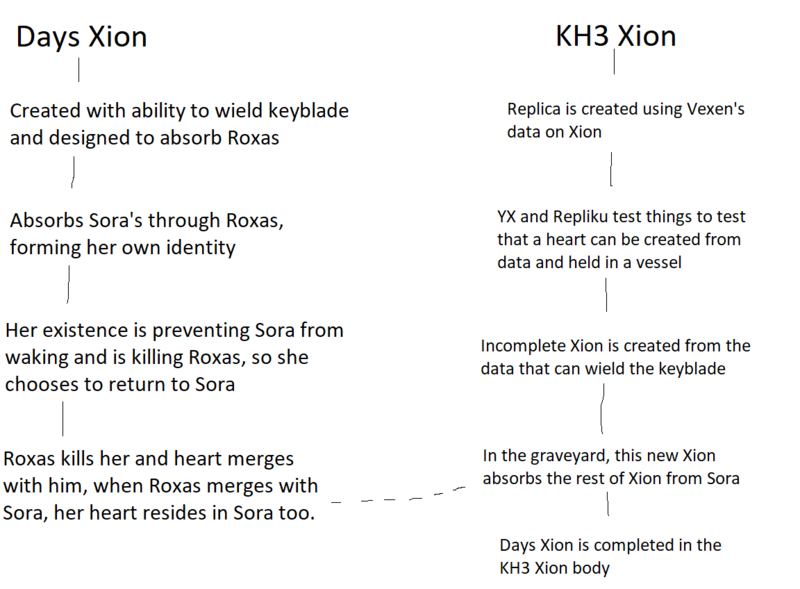 I think the norts that came out of MX (xemnas, ansem sod, etc) were in vessels while characters like larxene and marluxia were nobodies. Also, anyone noticed that demyx and vexen are actually still nobodies in the end. I think that's interesting since demyx was one of the characters referred to as holding the keyblades secrets. He obviously doesn't remember as a nobody, so maybe he'll have to be re completed at some point. Young Xehanort, Ansem, Xemnas, Dark Riku, and possibly Xion were brought from the past as hearts. But in order for them to stay in the present they needed bodies to inhabit, and thus were given Replicas. Master Xehanort himself might even be using a Replica, but that's speculation on my part. It would explain why he abandoned Terra's body. A Replica would be stronger but still look like him and not fight back. Vexen, SaÃ¯x, Demyx, Luxord, Marluxia, and Larxene were all turned back into Nobodies somehow. Or they never actually died as Nobodies in the first place. A confusing plot point lol. Terranort was the only fully recompleted one there along with Xehanort himself. Vanitas was recreated from the negative emotions in Monsters Inc. But in the end credits, Vexen was shown with his original eye color, meaning he recompleted. I actually have a theory that once recompleted, the person can simply choose which of their two "existences" that they wish to be. A Somebody or a Nobody. Re-completed means they're not an "empty shell" and have hearts again, so I don't think there's a choice there. Either that or enough time has passed that that he "grew" a heart, which seems too soon. Hmm, if that's the case I wonder what they'll do with Demyx since he wouldn't remember his past. You brought to my attention the fact that MX himself shouldn't exist in this time. It would make sense for him to be a replica, then again after defeated he turned into a heart and there was no replica body left behind. Thinking on that now he should've just come back as Terra-nort, which did happen, but MX himself shouldn't be around.